The 2019 Ford Ranger is a sporty and popular midsize pickup truck. This vehicle provides drivers and passengers alike with a number of features that are designed to enhance off-road travels. These features include on-the-fly 4 x 4 shifting as well as a proprietary terrain management service. The 2019 Ford Ranger doesn't require drivers to master complicated knobs in order to access 4 x 4 gear ranges. Rather, it employs the Ford electronic shift on the fly service which gives drivers their choice of high or low 4x4 gear ranges. 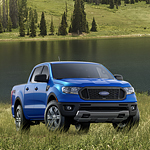 Now, Ford Ranger drivers can keep their vehicles in motion when it matters most. Complementing the on-the-fly system is the Ford Terrain Management System. This system offers drivers their choice of four distinct operation modes. These modes include Sand, Normal, Snow, or Grass. This service works seamlessly with the on-the-fly system to find just the right gear and engine ranges for the prevailing conditions.